​When you go to Guatemala you will be helping out children in the orphanage in very tangible ways. You’ll also get to share God’s love with them and spend a lot of time with them. More importantly you will receive heaps of love coming back to you from those young kids. You’ll feel a bond with them that you didn’t know could exist and will realize that these little ones are the very neighbors that Christ reminds us to love in the greatest commandment. Nuestros Pequeños Hermanos is a organization that models Christian values through serving the communities in which they live. NPH was founded by Father William Wasson, a Catholic Priest, in 1954. Nuestros Pequenos Hermanos is Spanish for “our little brothers and sisters.” These homes nurture orphaned and vulnerable children in a loving, stable, and secure family environment. They provide quality education, healthcare, and spiritual formation. For more information about NPH click here. ​The NPH Guatemala home is located in Parramos, Guatemala. 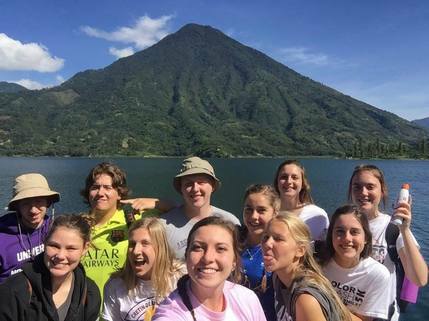 We also travel to Lake Atitlan in Santiago (roughly three hours from the home) and the former capital city of Antigua (roughly an hour from the home). We believe in the work that God is doing through our mission trips that we take every summer to Guatemala. For each trip we know that God is impacting the children in Guatemala and is impacting the youth who are able to experience serving in a new way. There are a few different ways that we serve the children at Casa San Andres. We have the opportunity to serve through work projects, by leading VBS- type programming, running after school activities for the children, and creating friendships with the NPH Guatemala community. Youth currently in the 9-12th grades. Participants can come with a group or you can sign up as an individual. Churches and other groups can register as well. We’ve had church youth groups, school groups, and FCA groups join us in the past. College-age young adults are also invited to serve on a mission trip with us. This is a great option for young adults who might not be able to give up their whole summer to serve on a mission trip but still want an opportunity to be on mission. In addition to the serving that happens on the Mission trip you will be experiencing excursions that are unforgettable. We will be traveling to Antigua, one of Guatemala’s oldest established cities and riding across Lake Atitlán. In Antigua, the former Capital City, you will experience a walking tour that will help you to understand the history, people, and culture of this beautiful colonial city. One of the first things you will be able to see is that the city sits at the base of massive volcano. Next you will be able to experience the colonial city, all the travel that goes through it and the massive outdoor shopping market. During this tour one of the things you will be able to see is the ruins of the San Jose Cathedral. As you tour this 300 year old church you will hear the history and see the beauty of it. Experience one of the original Seven Wonders of the Natural World on our trip across Lake Atitlán. Your group will travel to Panahacel, Guatemala to board a boat to see the lake. As you travel to Panahachel you will be able to see the culture of Guatemala. You will drive through the country side and see the everyday lives of the people who live in these villages. Once you arrive to Lake Atitlán you will board a boat that takes you across this beautiful lake. One of the first things you will notice about Lake Atitlán is that it is in the crater of an inactive volcano with three other volcanos surrounding it. The lake is about 1,000 feet deep and will take your breath away. Crossing the lake will lead you to a village that you will get to tour. This incredible tour will help teach you about the history of the area and the Mayan people who live around the lake and its three volcanoes. We will also spend time touring and shopping in a modern Mayan village.